The Leadership Academy was developed to build capacity, and ensure the organization’s longevity through succession planning of leaders ready to step up and lead the way. 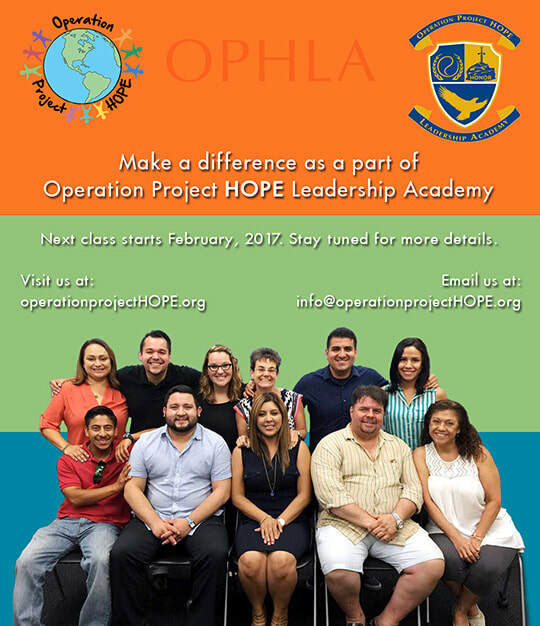 Operation Project HOPE Leadership Academy (OPHLA) is 6-month leadership program designed to develop leaders, empowered by their wholeness to make a difference in their own lives and the lives of others. The objective is to build on the Operation Project HOPE (OPH) legacy through empowering leaders within the organization to expand and enhance the overall service of the organization. Establishing an ever ready pool of leaders supports Operation Project HOPE with a cadre of captains ready to step into leadership positions on beautification projects. New leaders will not only sustain the growing organization, it will ensure that OPH continues to be relevant, cutting edge and about the children. Leaders may also serve as board members ensuring steadfast growth while staying true to its principals. The Academy seeks to develop leaders through the Pillars of Leadership, from an intellectual or “doing” (commitment, honesty, integrity, responsibility, respect and empowerment) and a heart-centered place or “being” (kindness, wholeness, connectedness, accepting, equality and faith). 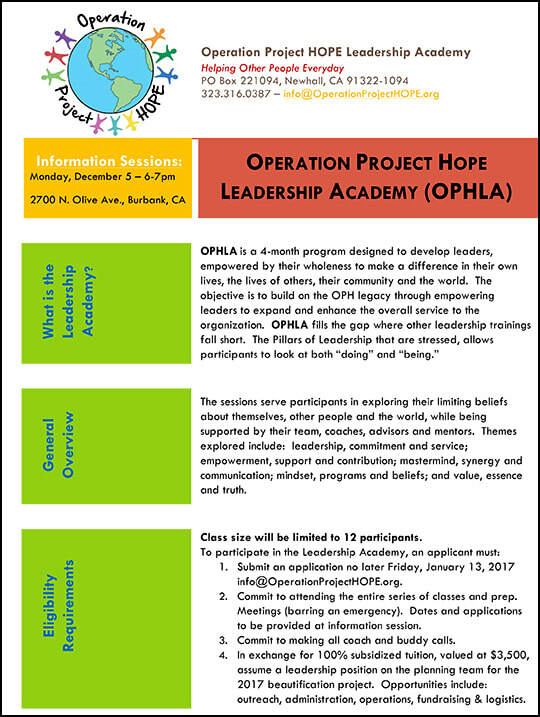 OPHLA fills the gap where other leadership trainings fall short. The Pillars of Leadership that are stressed, allows participants to look at both “doing” and “being.” This approach to leadership-of-self sets leaders up for professional and personal successes. ​OPH welcomes donations of time, talent and financial contributions, which are tax deductible. Operation Project HOPE is a non-profit organization. Your donation to this 501(c)(3) organization is tax deductible to the fullest extent of the law. EIN 46-5481217. If you have any questions about your donation please contact Operation Project HOPE, Inc. info@OperationProjectHOPE.org.